I have a dream house that lives in my head and some sections of it are completely decorated down to the last detail. Take for example the hallway, it would be a Victorian villa hallway complete with encaustic tiles. Encaustic tiles have the pattern burnt into them so it can’t wear off the tile, how cool is that? One of the best places to see this type of tile is Christ Church Cathedral in Dublin. I could spend the better part of an afternoon looking at their floors. When I bought my first house in merry old England I was hoping for encaustic tiles lurking under the carpet or the laminate floor, it was an Edwardian house with some period features still intact, maybe I was in with a chance – sadly no. To me decorating is all about incorporating what you love into your home, without breaking the bank and without waiting for your ‘perfect house’ house to appear. 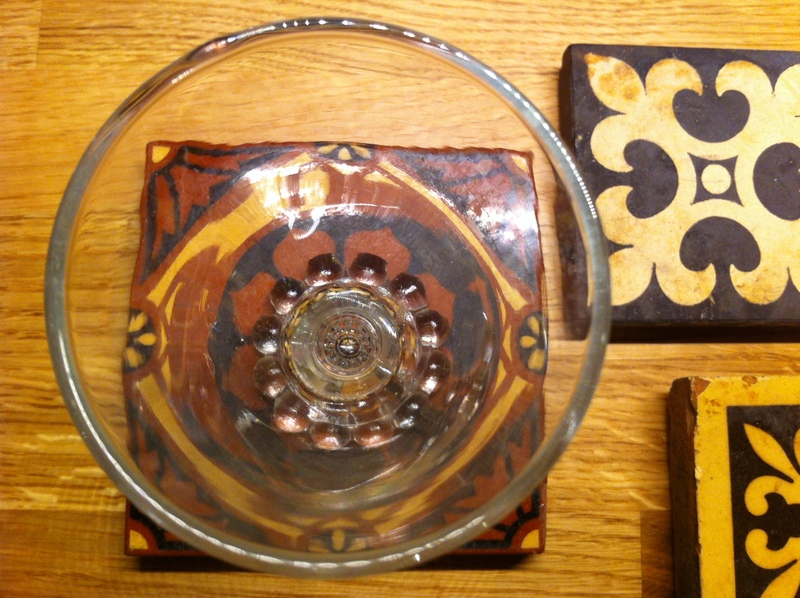 I present to you my encaustic tile assembly to date. Exhibit A – when I lived in Morocco my friend Aicha gave me and my good friend Jen one of her roof tiles each wrapped in a traditional scarf from the region as a leaving gift. It was one of the best gifts I have ever received. It’s been on display in every house I’ve lived in since and currently resides on my bedside table. 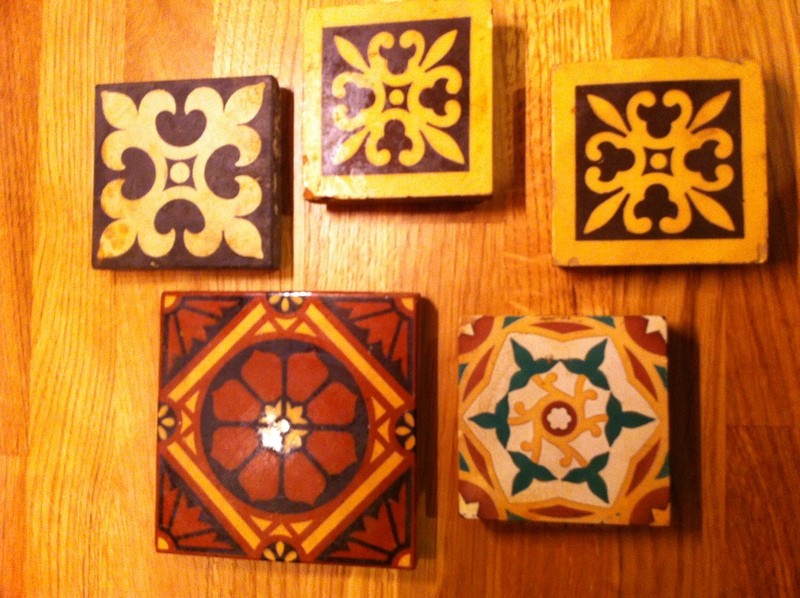 Old encaustic tiles are usually pretty spendy and you only ever see a few together. While on holiday in deepest Shropshire (serious Bilbo Baggins countryside) me and the other half spied these gorgeous beauties in the window of an antique shop run by a lovely man and his dog. We bought 2 and then went back for the rest (it would have been wrong to separate them). I try to abide by the rule of William Morris – beautiful and useful. After adding some felt to the back I present to you my new coasters. Living the dream, one coaster at a time. 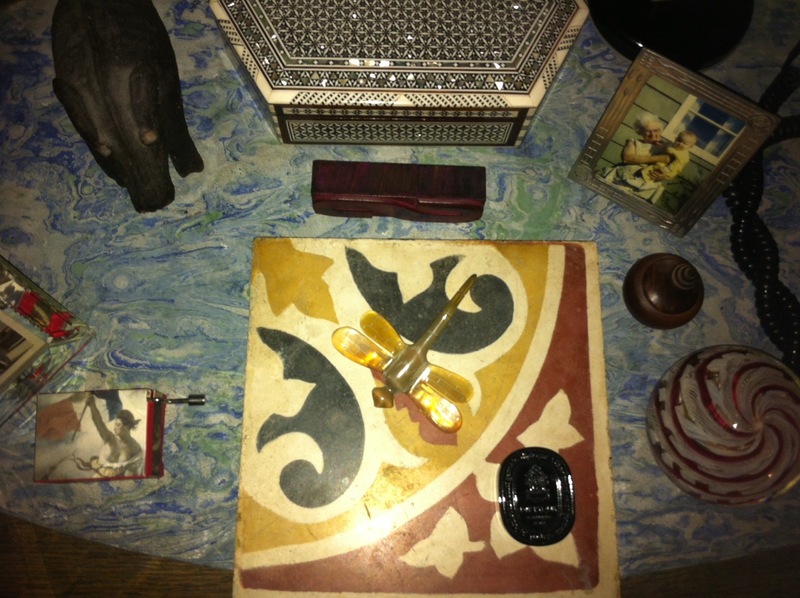 This entry was posted on January 15, 2014 by The Sourcerist in Inspiration and tagged coasters, encaustic tiles, Morocco, zero to hero.